Michell's Farm is a sixth generation family owned and operated farm that has been growing on the Saanich Peninusla for over 150 years. We grow over 50 varieties of fruits and vegetables as well as hay, grain and pasture raised beef. Since it was originally established in the 1880's, Michell's Farm has grown from a 100 acre farm to its current 400+ acres which produces over four thousand tonnes of produce annually! 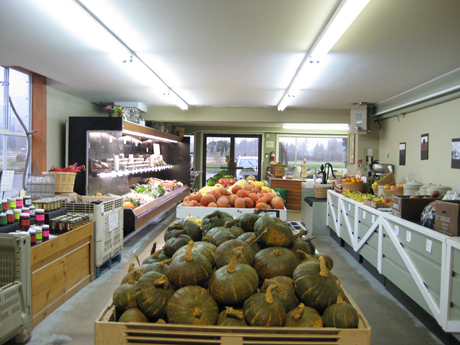 At Michell's Farm Market located at 2451 Island View Rd you will find seasonal produce grown right here on Michell's Farm and local farms. We also carry many locally made products including baked goods, honey, vinegars and much more! Michell's Farm was originally established in the 1860's by William Michell, who purchased a 100 acre farm on the Saanich Peninsula with money he made gold mining during the goldrush. The farm started out growing mainly potatoes and over the years began growing a few more varieties of vegetables and berries. Michell's Farm along with many farms were well established when the federal government put a ban on growing potatoes in Central Saanich. This was when the golden nematode was discovered in the 1980's. The ban was quite an interruption to the local farming community, but it pushed the Michells to start experimenting with growing other vegetables which has led to the wide selection of produce grown today. The farm is now 400+ acres and leases an additional 100+ acres and is still owned and operated by the Michell family with the sixth generation currently actively farming!